The Association for the Advancement of Sustainability in Higher Education recognizes U.S. and Canadian colleges and universities that implement sustainability programs and practices on campus. Their Sustainability Tracking, Assessment & Rating System™ (STARS) allows institutions to evaluate and report their sustainability performance with more than 100 criteria across four areas: Education & Research; Operations; Planning, Administration & Engagement; and Innovation. A number schools have earned credits by incorporating Macmillan books into a themed semester or year focusing on sustainability or by including sustainability in new student orientation. Read about three of them now and stay tuned for more! The University of Colorado, Colorado Springs (Silver) has been recognized for their sustainability-related themed year: Sustainability and Community, and for assigning Colin Beavan’s No Impact Man as the summer reading book for incoming first-year students. The university also earned points from AASHE with the organic garden operated on campus by the Students for Environmental Awareness club; annual participation in Recyclemania, “a friendly competition among college and university recycling programs In North America and Canada”; hosting their third annual Bike Jam, which has grown into a month-long Bike Month Challenge; and more. Ball State University (Silver) earned points for selecting Elizabeth Kolbert’s Field Notes from a Catastrophe for the Freshman Connection common reading assignment in 2008. Elizabeth Kolbert visited campus to speak that year; in addition, authors Thomas L. Friedman and Ray C. Anderson, among many others, have given lectures on campus or keynotes at the university’s international interdisciplinary Greening of the Campus Conferences. Most recently, administrators and faculty from campuses all over the country attended Greening of the Campus IX: Building Pedagogy at BSU in March 2012. Green Mountain College (Gold) racked up points toward their Gold rating with a themed semester that featured Alan Weisman’s The World Without Us. As incoming freshmen, all members of the class of 2013 received a copy of the book from the college. That fall, it was a central to their core writing course, Environmental Liberal Arts 1000: Images of Nature. Additionally, GMC seniors read Mr. Weisman’s Gaviotas: A Village to Reinvent the World in their capstone seminar, and the author, the Fall 2009 Scholar in Residence for the master’s degree program in environmental studies, discussed both books with the undergrads at several events throughout the semester. Among the many other AASHE approved programs at GMC are: incentives for faculty who develop courses that address sustainability learning outcomes; and the REED Club, an academic program for students interested in pursuing Renewable Energy and EcoDesign (REED) certification in addition to their degree. In the fall of 2012, the curriculum will expand and GMC will offer a full 42-credit REED degree! Macmillan’s Common Reading March Madness Picks! Colleges and universities of all sizes in all regions are gearing up for the NCAA Men’s Division I Basketball Tournament and Macmillan wants in on the bracketology! 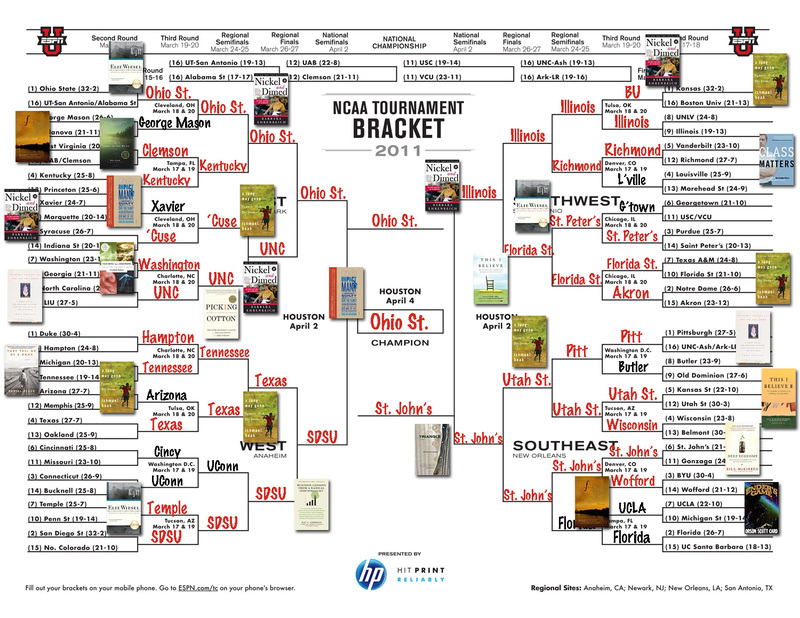 Since I’m all about selecting winning books for common reading, I based my bracket picks on the schools that have adopted Macmillan titles for their programs. When neither school had—at least, not this season!—I went with the lower seed (those picks are noted in black). When Macmillan adopters went head to head, I used seed positions to make my predictions, as well. I proposed the common reading bracket with tongue in cheek, but my little experiment has been fun and informative. Here we have a whole new perspective on the trends and the diversity in common reading selections at schools across the country. As you can see, the competitors are very well read! In the East, Ohio State is the favorite with Elie Wiesel’s Night, Barbara Ehrenreich’s Nickel and Dimed, and Colin Beavan’s No Impact Man. First Four victor Clemson has previously adopted Ron Rash’s novel One Foot in Eden, and they’ll be reading his Saints at the River this fall. Common reader MVP No Impact Man is the Fall 2011 book at the University of Kentucky. Nickel and Dimed has been the common reading title at both UNC, Chapel Hill and Syracuse University. The UNC Tarheels have also read Picking Cotton and The Spirit Catches You and You Fall Down, while Syracuse has adopted A Long Way Gone. The University of Washington represents with Elizabeth Kolbert’s Field Notes from a Catastrophe. Ishmael Beah’s A Long Way Gone dominates in the West, where the universities of Texas and Tennessee have both selected the book. Hampton University first-year students have been reading Daniel Black’s They Tell Me of a Home just this year and Temple’s have read Elie Wiesel’s Night. Number two seed San Diego State University has adopted Ray C. Anderson’s Business Lessons from a Radical Industrialist. Next, we go to the Southwest, where Boston University has favorites Nickel and Dimed and A Long Way Gone on its roster. The University of Illinois has also adopted Nickel and Dimed and the University of Akron has chosen A Long Way Gone. Class Matters has been read campus-wide at the University of Richmond, while Saint Peter’s has adopted Night. Florida State students submitted their own “This I Believe” essays when the university picked This I Believe—how many of the Seminoles wrote about basketball? Finally, in the Southeast, University of Pittsburgh students have read Anne Fadiman’s The Spirit Catches You and You Fall Down. Utah State has adopted Ishmael Beah’s A Long Way Gone and Wofford College freshmen have read Orson Scott Card’s Ender’s Game and Ron Rash’s One Foot in Eden. Students in the University of Wisconsin system, from Parkside to Marathon County, have read everything from This I Believe II to Deep Economy; I hope they’re all united behind the Badgers from Madison! But can sixth-seed Saint John’s take Katharine Weber’s Triangle all the way to the championship? The Big Dance begins tomorrow—what book are you rooting for? P.S. For more unconventional bracketology for academics, check out The Chronicle of Higher Education‘s Tweed Madness! Saint Michael’s College has adopted Elizabeth Kolbert’s Field Notes from a Catastrophe: Man, Nature, and Climate Change as the common reading book for their First-Year Seminar this year. In fact, the program kicks off even before classes begin. Once they’ve registered for classes, students will receive an introductory letter and their first writing assignment, based on the book, from their future seminar instructor. The assignment will be due on the first day of the seminar in August. “This approach has had terrific results in enabling us to get right into discussion on the first day of class, rather than just going over a syllabus,” writes the Coordinator of the First-Year Seminar program. In these small, writing-intensive courses, students explore broad questions in the liberal arts in an environment that encourages discussion and active learning. 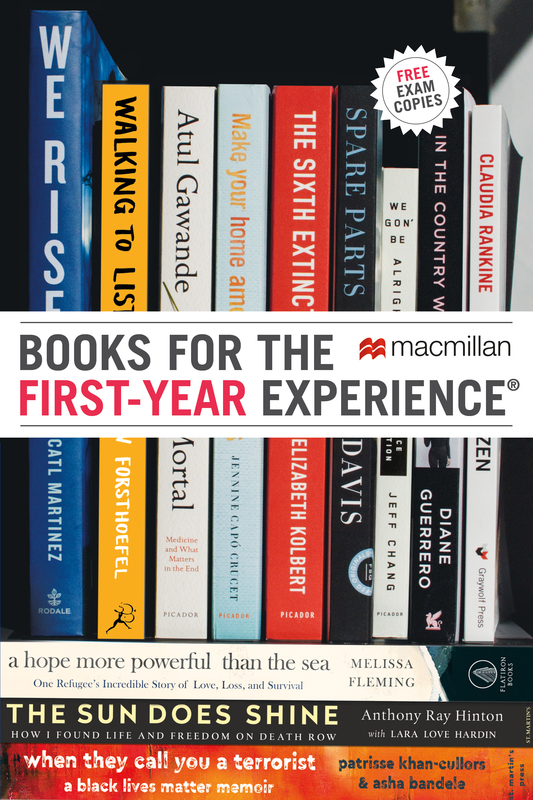 Field Notes from a Catastrophe is one of Macmillan’s Popular Picks for First-Year Reading! Click here to read a list of other colleges and universities that have used the book, and our other popular titles. David Finkel’s The Good Soldiers is the Common Book at Century College for the 2010-2011 academic year! Incoming first-year students and transfer students will all read the book, and many professors are likely to adopt it in their courses as well. The college will invite David Finkel to speak on campus in Spring 2011, when they are winding down their year with a book. Century College is a community and technical college outside of St. Paul, Minnesota. A considerable number of their students are veterans. The Common Book Committee is sure that The Good Soldiers will be a meaningful book for those students and for the college community as a whole. Click here to watch BookTV‘s video of David Finkel speaking about his time with Army Battalion 2-16. The Pulitzer Prize-winning Washington Post reporter spent 15 months with the soldiers, who were deployed to Baghdad 2007-2008. Elizabeth Kolbert’s Field Notes from a Catastrophe was the 2008-2009 Common Book at Century College. This year, all first-year students at Mount Holyoke College read Anne Fadiman’s The Spirit Catches You and You Fall Down: A Hmong Child, Her American Doctors, and the Collision of Two Cultures. Mount Holyoke’s First-Year Common Read program, which began in 2000, is one component of the college’s orientation program. Incoming students receive a copy of the book over the summer along with registration and other ‘welcome’ materials. During orientation in the fall, students come together to discuss the book with their new classmates and student orientation leaders. The shared reading experience provides a starting point for the first of the many intellectual engagements that will take place both inside and outside the classrooms in four years at Mount Holyoke. This year, other events surrounding the common read selection included a faculty panel for discussion of the book’s cultural, ethical, and spiritual themes, and a reading and talk given by the author, both open to the whole campus community. Students and faculty contributed their thoughts on a blog dedicated to the common read. In keeping with the oral tradition of the Hmong people, Mount Holyoke’s Language Resource Center and Library, Information, and Technology Services created Fish Soup, an oral history project that gives first-year students the opportunity to explore and preserve their college’s cultural history. Students are invited to, with a few guidelines, interview a peer, tell a story of their own, and, if they wish, contribute a recording to the Fish Soup archive. The Fish Soup project is a unique way for students to gain deeper understanding of their own experiences, hear about their classmates’ backgrounds, and practice using the resources and equipment available in the college library. Click here to learn more about the project, continuing in 2010. In previous years, Mount Holyoke has adopted Nickel and Dimed and Field Notes from a Catastrophe for the First-Year Common Read program. Click here to see lists of other schools that have used these Popular Picks for first-year reading! This summer, as they prepared and packed for their first year at St. Mary’s College of Maryland, first-year students were also reading Elizabeth Kolbert’s Field Notes from a Catastrophe. All incoming students were required to read the book in one of several interdisciplinary first-year seminars this semester. Faculty members were also encouraged to adopt the book in other courses throughout the 2009-2010 academic year. The two major goals of the common reading program are to show new students that, “In the academy, conversations and actions should be grounded in text, regardless of discipline [and] to challenge the way that academic and social life are assumed to be separate.” So, as a tie-in to the common reading program, the author will speak on campus next week, addressing all members of the first-year class as “guest lecturer” for their introductory seminars. Related campus programming, including a series of campus wide events called the “Environmental Action Symposium,” will continue through this semester. Learn more about the Summer Reading Program at St. Mary’s College of Maryland here. Field Notes from a Catastrophe has been a common book in recent years at Linfield College, Mount Holyoke College, SUNY, Oswego, and Vassar College.